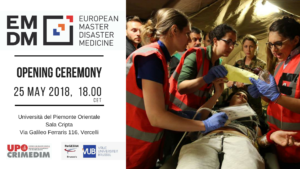 The Residential Course of EMDM 2018 will take place in Novara from May 25th to June 8th 2018. It will start with the opening ceremony on May 25th at 17.30 in Sala Cripta of University of Vercelli (Sant’Andrea). The Keynote speaker will be Raed Arafat, Undersecretary of State in the Rumanian Ministry of Health, involved in the development of the emergency medical care system in Romania.